How did His Excellency Kikaya Bin Karubi announce a fire 4 hours before it happened? While vehicles are burned all around, how did wooden pallets escape the same fire? 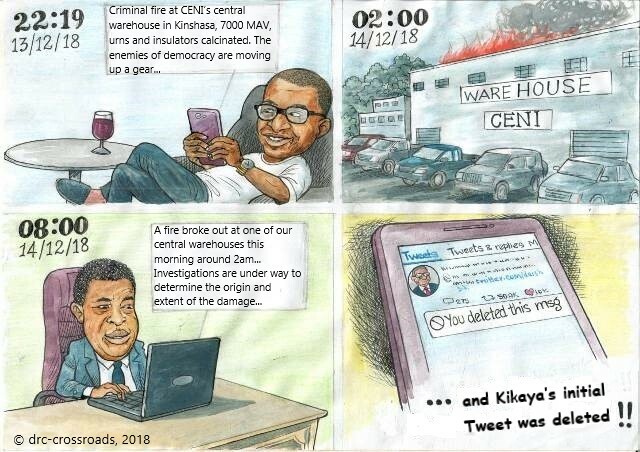 At the moment the CENI, 4 hours after the fire, says that “investigations are under way to determine the origin and extent of the damage“, how come that His Excellency Kikaya Bin Karubi already announced the extend of the damage (i.e., 7000 MAVs, urns and insulated corns) on December 12, 2018 – 4 hours prior to said fire? The CENI warehouse being located in one of the most secure areas of Kinshasa, how come that the guard assigned to the security of this place did not see anything coming? How come that Tele50 and Digital Congo, two broadcasting stations close to the government and, even RTNC, the national broadcasting station, which are keen on publicity, did not dare to show damaged or calcinated voting machines inside the warehouse? Finally, how can more than 7000 batteries burn without causing explosions? Eish! Our Excellencies Bin Karubi and Naanga, Bobwaka Lokuta!!! Are you throwing powder in our eyes?? ?